The average person’s dreary life consists of working one’s socks off on weekdays, and busting the accumulated stress while simultaneously being apprehensive of the coming week over the course of the weekend. When life becomes so tedious, the conspicuous cure that (ironically) nobody notices is nature.The mellifluous chirping of birds with iridescent feathers, the slender beams of the morning sun slashing through the copse to bounce off the bubbling water of a brook, the thrilling chase between the predator and its prey…can there be a better way to unwind than losing yourself to the wild? To help you in your pursuit of finding beatitude in a morose and mediocre life, Wildnest brings to you a list of weekend getaways from Delhi that you can escape to every other weekend. 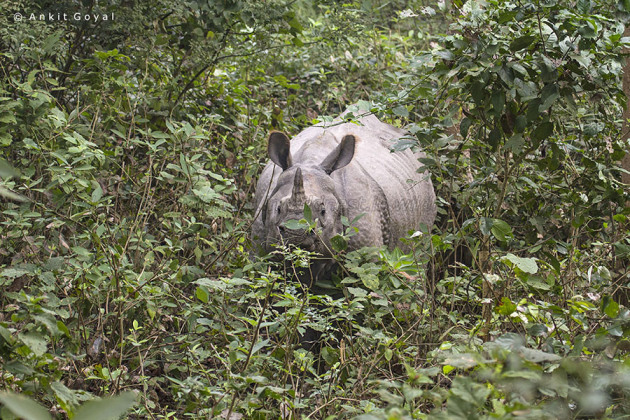 Rajaji National Park covers an area of over 800 sq. km, including the Rajaji, Motichur and Chilla wildlife sanctuaries. The river Ganga and myriad other brooks flow through the park, making it a haven for people who have a penchant for true beauty. 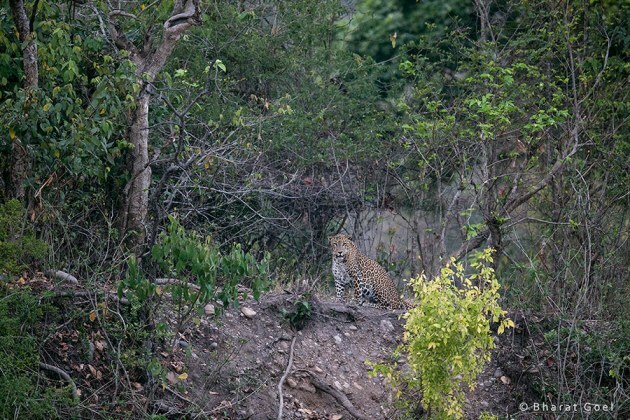 A motley crew of the wild creatures can be found at Rajaji National Park. This includes the Asian Elephant, leopard, goral, wild boar, sambar deer; the vivacious rhesus macaque and the hanuman langur; the elegant king cobra, krait, and monitor lizard. There are also almost 315 species of avian existence residing in the park. Some of the renowned ones are khaleej phesant, starling, pheasant, oriole, hornbills, and the national bird of India, the peacock. A large number of other migratory birds also visit the sanctuary in winter. Rajaji National Park is easily accessible to the common man. It is only 9km and 18km away from Haridwar and Rishikesh respectively. The nearest airport is Dehradun’s Jolly Grant Airport, at a distance of approximately 35km. Railway stations nearby are located at all the aforementioned cities. Go For: Asiatic Elephant, Tiger, Leopard, Goral, beautiful landscapes. Haridwar is the nearest city with lot of options ranging from budget to luxury. How to see wildlife: Two safaris in a day(morning & evening) in open gypsies, available on rent at the main gate with a guide to show you around in the jungle. One can also take personal car but its strictly not advisable as small cars are not appropriate for dirt roads and one cannot enjoy the beauty of jungle from the closed vehicle. Sariska Tiger Reserve is located in Alwar district, Rajasthan, approx three hours drive from Delhi. It covers an area of 866 sq. km, and lies at the base of the Aravalli Hills. The park was declared a wildlife sanctuary in 1955, and given the status of a tiger reserve in 1978. There was a time when there was no tigers in Sariska, all killed by poachers. 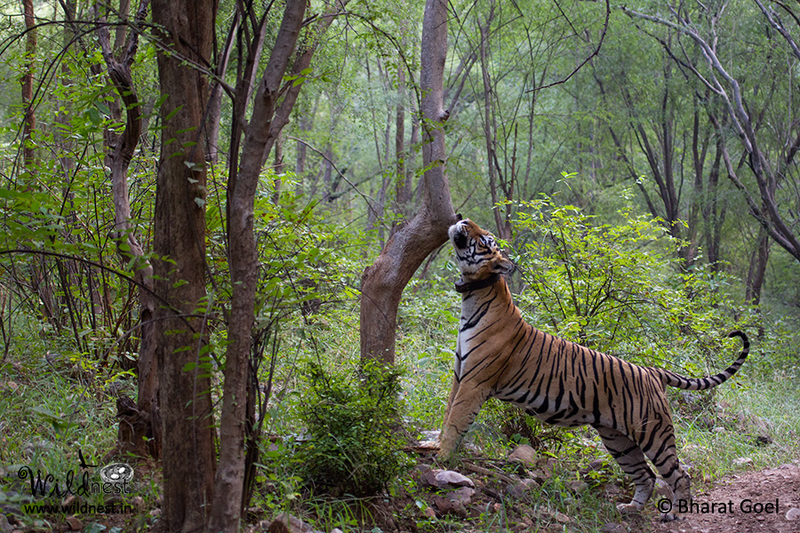 Then tigers were trans-located from other parks mainly from Ranthambore National Park. Recently two cubs(orphan cubs) B1 & B2(B represents Beena kak), named by Beena Kak – Forest minister of Rajasthan were trans-located from Ranthambore. 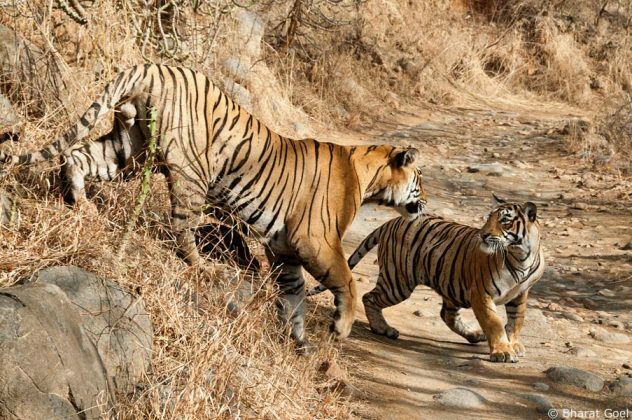 As of now Sariska has 9 tigers. Sariska is considered one of best place to see Indian peacock because of large number of presence and also known as “peacock sanctuary”. It also has very good population of sambar deer, which gives one a good opportunity to photograph them in different behavior. The diverse fauna found at Sariska includes (apart from the famous tigers) the leopard, hyena, golden jackal, blue bull, antelope, and the wild boar. A large variety of birds are present too, such as the golden beaked woodpecker, peafowl, bush quail, grey partridge, and The Great Indian Horned Owl. A major non-living attraction of the sanctuary is the Kankarwadi Fort, located in its heart. The nearest airport from Sariska is at Jaipur, approximately 180km away. The tiger reserve’s closest railway station is at Alwar, at a distance of 35km. Buses also ply regularly from Delhi and Jaipur towards Sariska. How to see wildlife: Two safaris in a day(morning & evening) in open gypsies(6 seater)/canters(20 seater) available on rent. One should book the seats prior before visiting the place as limited seats are available. Also known as the National Chambal Gharial Wildlife Sanctuary, Chambal is a 5400 sq. km area located at the joint borders of Rajasthan, Madhya Pradesh, and Uttar Pradesh. It serves as a reserve for the critically endangered crocodile, the river dolphin, and the red crowned roof turtle. 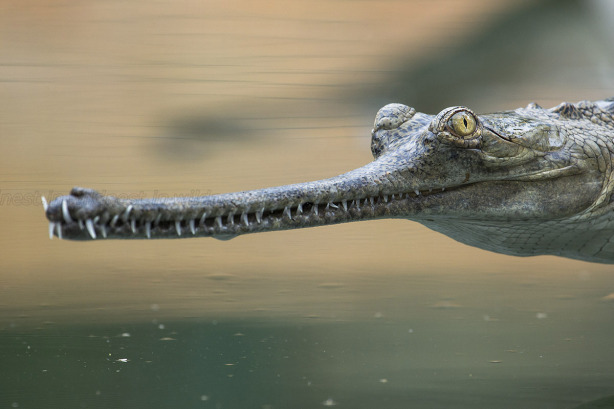 The National Chambal Sanctuary is also a home to many other threatened species, namely the Muggar Crocodile, Striped Hyena, Indian Wolf, and the Smooth-coated Otter. The other mammals found here include the Bengal Fox, Rhesus Macaque, Indian Grey Mongoose, Northern Palm Squirrel, Indian Flying Fox and the Indian Gazelle. Over 320 different kinds of avifauna reside at the sanctuary, such as the graceful Indian Skimmer, Pallid Harrier, Brown Hawk Owl, Red-crested Pochard, and the Sarus Crane. Chambal Wildlife Sanctuary is easily accessible by road from the major cities of Agra and Mathura, with an approximate distance of 70km and 120km respectively. It is also just 270km from Delhi. The nearest airport and railway station to Chambal are located at Agra. Go For: Gharial, Ganges river Dolphin, Indian Skimmer,Red-crowned Roof turtle and beautiful landscapes. How to see wildlife: Chambal River flows from three states Uttar Pradesh, Rajasthan and Madhya Pradesh. So there are different boating points available. One can stay in Ranthambore and go for boating point, which is around 40 kms from Ranthambore. Dholpur situated in Rajathan is second option. One can stay there and go for boat safari at Rajasthan-Madhya Pradesh border. Third and most expensive way is to stay at Chambal Safari Lodge(in Bah, Uttar Pradesh), they run private boat safaris in Chambal river. Ranthambore, one of the most famous and largest national parks of India, is located in the Sawai Madhopur district of Rajasthan, about 130km south east of the capital, Jaipur. It was established as the Sawai Madhopur Game Sanctuary in 1955, and covers an area of 392 sq. km. 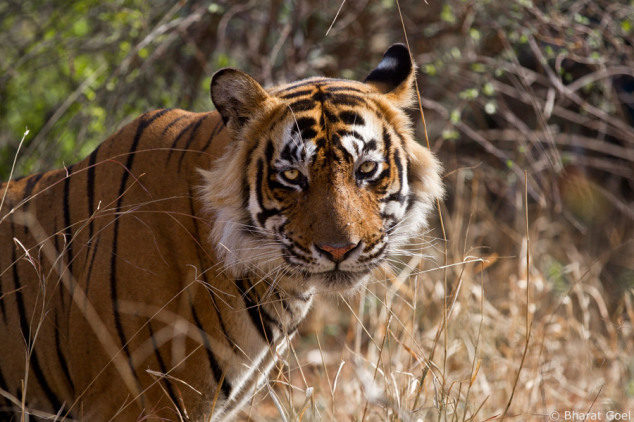 Ranthambore is globally renowned for its diurnal tigers. Other mammals that reside here include striped hyenas, jackals, black bucks, common langurs, flying foxes, civets, long-eared hedgehogs and common mongooses. There is also a wide variety of reptiles present, namely the banded kraits, Indian chameleons, desert monitor lizards, vipers, and North Indian flap shelled turtles. The avifauna is eclectic as well, with over 270 different species found in Ranthambore. The eminent birds are the graylag goose, Asian palm swift, cormorant, heron, wagtail, iora, and the Indian gray hornbill. The nearest railway station to Ranthambore is situated at Sawai Madhopur, where trains travel to and fro Jaipur and Kota; where the closest airports are located. It can be reached easily via road from Delhi, as the distance between the two is not more than 385km. Go For: Tigers and beautiful landscapes. Dudhwa National Park is a part of the Dudhwa Tiger Reserve, located in Terai, Uttar Pradesh. It covers an area of 490 sq. km, and is the last remnant of the Terai ecosystem. 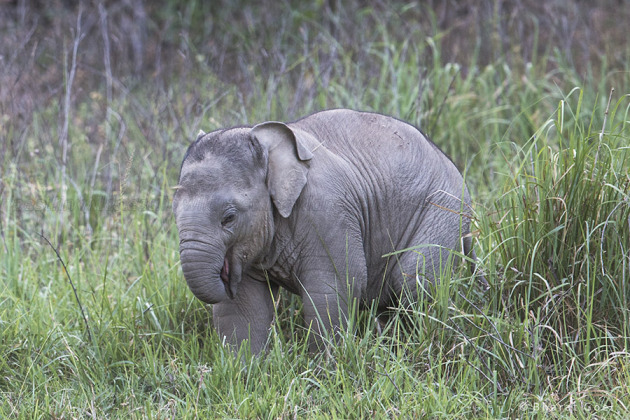 It is a safe haven for 13 endangered wildlife species. Dudhwa is reputed for its tigers, swamp deer, rhinos, crocodiles, and Bengal florican. The other animals include the barking deer, hog deer, sloth bear, ratel, and fishing cat. The park has a rich avian life of over 350 species present, namely the swamp francolin, painted stork, barbet, minivet, and the great slaty woodpecker. Endangered reptiles such as the Gangetic soft shelled turtle, Indian tent turtle, gavial, eastern hill terrapin and spotted terrapin also reside in the sanctuary. The nearest railway station to the national park is in the city of Dudhwa itself. The closest airport is in Lucknow, about 223km away. It is easily accessible by road from Delhi, being at a distance of only 460km. 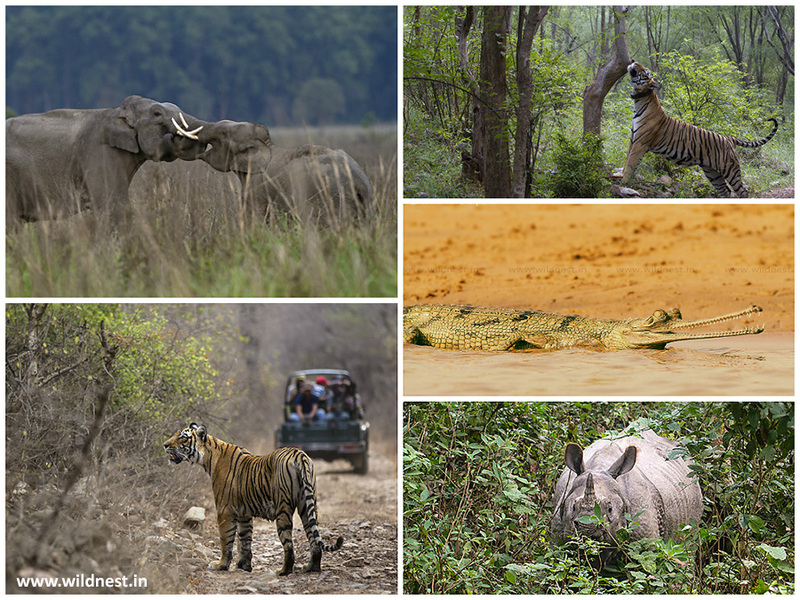 Go For: Tigers, Swamp Deer(Barasingha), Bengal Florican, One-horned Rhinoceros, beautiful landscapes. Forest huts at Dudhwa Camp.